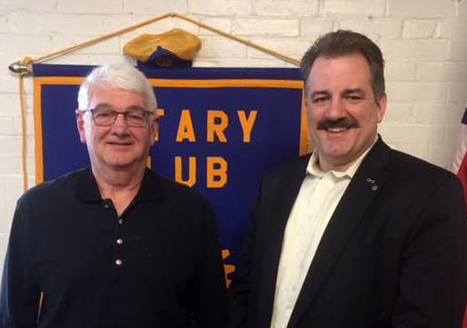 Greg Trundy, fellow Rotarian and local sanitation engineer, gave a presentation on the town’s sewage system at the River Valley Rotary Club Luncheon held at the HOPE Association on April 9. He has been the Rumford-Mexico Sewerage District superintendent for 35 years and gave a history of the district. He described the treatment processes, including the composting system, and ended by talking about challenges the district faces. From left are Trundy and Randy Therrien, club president.